In our previous articles from this series, we discussed ways tocreate an enjoyable space in your laundry room by adding different features from proper lighting to great laundry room storage. While those details are crucial, countertop and flooring options are also extremely important – after all, there may be times when you spill that bottle of laundry detergent. When choosing your countertops, be mindful of what you’re using the space for. In a laundry room, you need a surface that holds up well against moisture, and also puts up a resistance to stains and chemicals in the events of bleach or laundry detergent spills. Laminate – The top rated surface for all around use, as well as the most cost effective, is laminate. Laminate is made up of layers of resin-coated paper fused together under high heat and pressure, with a top layer of decorative paper and a hard plastic overlay. The options for color and pattern are endless. On the downside, laminate is not your most heat or scratch resistant options. Tile – This is another option, as it is durable, stain resistant and clean looking. The main downside with tile is that you have to be careful not to stain the grout, and it could potentially crack. Granite or Quartz – If you want to spend a little more money and prefer stone, granite or quartz countertops have an elegant look and are the most durable and easy to care for in the natural stone family. 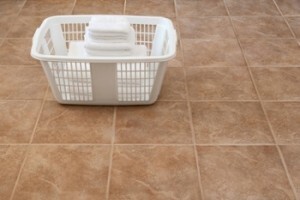 There are a few things to keep in mind when it comes to choosing flooring for your laundry room. For starters, you will likely be standing for long periods of time, so choose less dense materials which will be easier on your feet and back. Look for water resistant options; not only for the day-to-day water drips, but in the event of a leak from either the plumbing or washing machine. There are also flooring materials that can help absorb sound a little more than others, which would help lighten the noise level when your washer or dryer are running. Vinyl – Although vinyl may dent and tear easily, it is a “warmer” material, easy on the feet, absorbs the sound vibrations of the laundry machines, is water and stain resistant, and won’t cost you an arm and a leg. Ceramic tile – Tile is another option with great durability. It’s easy to clean, and is water and stain resistant. But, as goes with most things in life, it can have some negatives. Opting for ceramic tile will not be the best option for sound absorbtion, and won’t keep you comfortable when standing for long periods of time, as it is a hard surface, so make sure you have a comfortable pair of slippers on hand. Rubber mat flooring – While we wouldn’t recommend this for your entire room, rubber mat flooring is a great option to reduce the noise and vibration transfer of laundry machines. It provides a cushioned work area, and acts as a non-slip surface in any wet areas. Whatever decisions you make for your laundry room, make sure it ends up as a functional and somewhat comfortable space. Just because the laundry room is often hidden from guests doesn’t mean you shouldn’t spruce it up to enjoy it yourself.